Whether it’s waving the rainbow flag in support of queer rights or splashing some colour around town, the world is transforming from the monochromatic one it once was through a variety of new and creative ways of campaigning. Through the use of social media and the Internet, the colourful campaigns are having a global effect with countries all over the world sharing and adopting each other’s techniques to make this world a brighter one. From online to on the footpath or road, activists have gone back to their childhood roots by protesting or campaigning by means of colourful chalk (dubbed as the ‘new weapon of mass destruction’) and pavement, an act known as chalktivism. 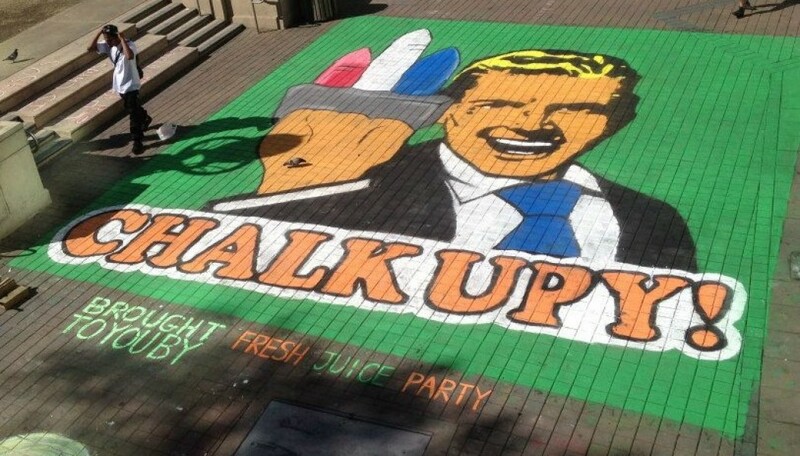 One of the first chalktivism campaigns ran last year during the OccupyLA protests when a group of protesters organised a “Chalk Walk” to celebrate and defend their “right to free speech”. The event was targeted at the Los Angeles Police Department (LAPD) and the city of Los Angeles to remind them that chalking (writing on public property with chalk) is not a crime. 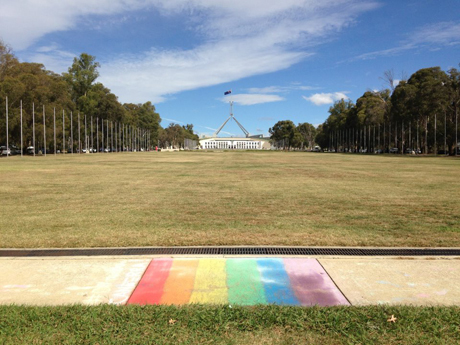 The trend has recently made its way to Australia with the #DIYrainbow protest. The campaign involves drawing a rainbow made from chalk on a pathway, walkway or road to protest the removal of Sydney’s Rainbow Crossing at Taylor Square, which was put in place during this years Mardi Gras. The crossing was a form of public art and for many it is a symbol of how far the city, if not the world, has come in their views and support of queer rights. The rainbow crossing was removed in early April, however this did not stop the #DIYrainbow protesters with rainbows being chalked all around Australia as well as other countries such as the United States, United Kingdom, Canada, Thailand, Croatia, Fiji, Sweden and Kenya amongst an array of others showing their support. With New Zealand recently legalising gay marriage, it would be unlikely that the chalk rainbows will be disappearing any time soon and perhaps the focus of the campaign will shift from the crossing to gay marriage debate here in Australia. Stemmed from the founder who helped out with the “scarfing” of the four London lions in Trafalgar Square to raise money for Cancer Research UK came the group Knit the City. 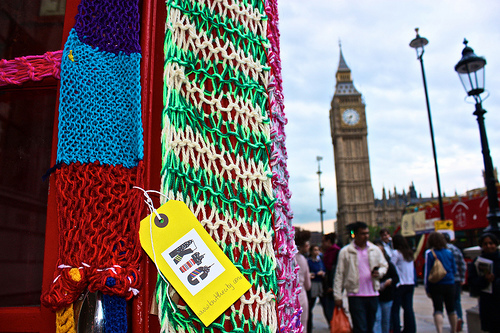 The group’s first knitting target was a telephone box in Parliament Square and from then on they covered everything from army tanks, poles, buses, cars, taxis and statues. They were recently hired by Toyota‘s ad agency to craft a spring themed motif in a London underpass for their “positive power” campaign to promote the Prius plug-in hybrid. The aim of this form of street art, known as yarnbombing, is to liven up sterile or cold public places. While the phenomenon hasn’t made the same impact in Australia just yet, Knit the Cityhopes to encourage others around the world to do the same and transform their city into something colourful. Essentially, they want to change the way in which people view the world. Not every campaign uses colours to brighten up the world but through Beyond Blue’s Capril campaign, they hope to be able to do just the same. The Capril campaign asks people to wear capes throughout the month of April while doing everyday activities such as grocery shopping or going to school, etc. to show their support for those who suffer from depression. The campaign aims to raise awareness of depression and to promote action to help fight it. The website states, “by participating you will hopefully encourage people to talk about it, and that is the first step towards removing the stigma associated with mental illness.” Capril has been running for a few years, following the death of one of the founders, Richard Marsland, and has gained support from notable Australian figures including Rove McManus and Chas Liccardello. Through chalk, yarn and capes, online and on the road, gone are the days of the monochromatic pages of the petition. Activists have redefined the way in which we fight for a worthwhile cause having invented more colourful and creative means of protesting and campaigning. With the Internet making these ideas more accessible to the broader public, protests are no longer just about local problems, rather issues are being talked about and combated on a global scale, making this world just a little bit brighter.